Richard Dawson, 85, formerly of Linwood, died July 25, 2013, at the University of Iowa Medical Center in Iowa City, Iowa. Services were held on Saturday, July 27, 2013, at the First Presbyterian Church in Schuyler. Burial was in the Linwood Cemetery at Linwood. Richard was born Aug. 21, 1927, in Lincoln to Harold and Doris (Backen) Dawson. He attended school in Linwood and then Schuyler before attending a Military Academy. 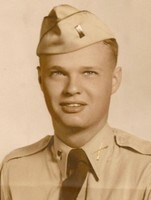 He graduated from West Point Military Academy in 1951 and then served in the Army until 1955. He was stationed in Japan during the Korean War. Richard received his MBA from Northwestern University/Rollins College and his Masters in Statistics from the Department of Agriculture. He was a GS/5 government employee and worked for the Department of the Army (Chief of IT Department JCAP) from 1974 to 1980, the Department of Agriculture from 1980 to 1982 and State Department from 1982 to 1993. He was a member of the Young Republicans (Past President of the Orlando, Fla., Chapter), Kappa Sigma (Northwestern University), West Point Alumni Glee Club, Officers Service Club and the Hexagon Club. Richard is survived by two sons, Richard B. Dawson, Jr. of Denver, Colo., Daniel G. Dawson II of Gainsville, Fla.; one grandson, Steven E. Dawson of Lincoln, and one grandson, Steve; Richard’s ex-wife, Heike Dawson of Davenport, Iowa.